The national interest in photography continues to skyrocket. Stories are more often being captured in pictures as opposed to text. If you want to take picture perfect photos, learn about camera equipment or aspects of the photography business, register for one of our upcoming photography courses. Do you know everything about your camera? 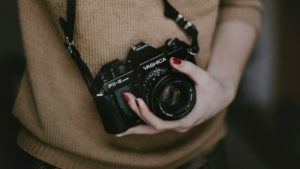 Looking to learn how to be a great photographer? By taking this introductory course, you’ll learn digital camera operation and photographic fundamentals. Topics include: exposure modes, aperture, shutter speed, flash, histograms and exposure compensation, white balance and other in-camera overrides. Bring your camera and instruction manual. Why is a picture “worth a thousand words?” Because great photographs tell stories. In doing so they make a connection, evoke an emotion, kindle a memory, show a relationship, and provoke a response in the viewer. But to tell a story with your photograph, you must have a strong concept of just what you want to say combined with strong composition. In this class, explore how to share your story through a single image as well as through sequences. Learn how to launch and upkeep a profitable photography based business. Topics will include structuring your business, client relations, pricing, marketing, managing your brand online and offline, and all the legal aspects of photography. Together we’ll create a step-by-step business plan to get you started and set you up to succeed. Learn how to add movement to your images with long exposure, no matter the time of day in this new hands on course! Learn and practice shooting images at night, and in low-light situations. Learn how to add movement to your images with long exposure, no matter the time of day! Produce fabulous images in any type of light, and learn how to use motion to tell a story. Click here to learn about all of our photography offerings. Register today!